The research on low-cost, educational robotics led by Drexel University professor Pramod Abichandani was the focus of a profile I wrote for the college’s academic journal. It ran this summer. We’ve written about him on Technical.ly here. My piece was a bit more focused on his research process. Find the full story online here. As I do with my freelance writing, I have some extras that I cut from the story below. 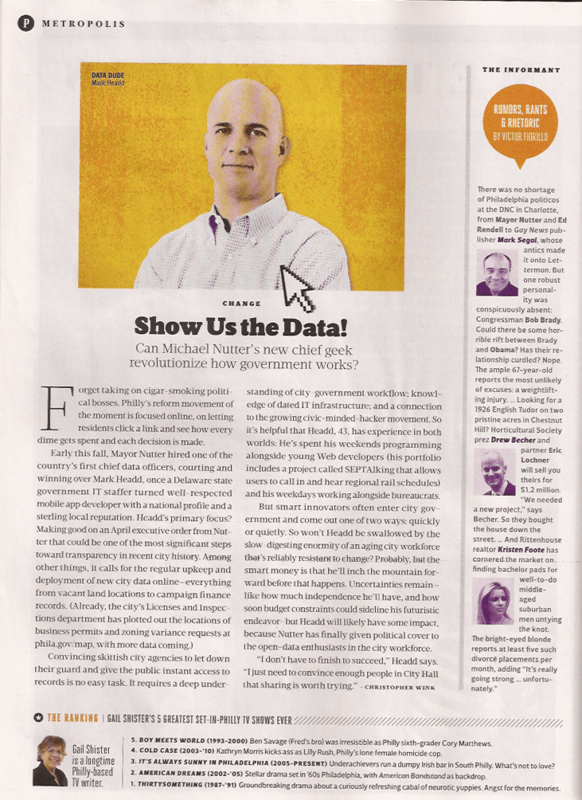 The future for the new City of Philadelphia Chief Data Officer Mark Headd and his role on this local government’s online transparency was the focus of my first contribution to Philadelphia magazine. I’ve followed Headd, the city’s transparency movements and the open government movement for years, so I was eager to pitch and report out a more general-interest focused story. I was also excited to get the piece out to a broader audience — thanks to editor Tom McGrath for the interest and the opportunity. I suggest you buy a copy, but you can also see the story online. As always, I share some of what didn’t make it into the story below. More than 20 years after the Internet and web-based technologies stormed onto college campuses, the life of a university student is still rapidly changing. So goes the focus of another feature I did for the newly rebranded Temple University alumni magazine. Read the story here or see the sleek new design here [PDF]. As usual, below I have some background and interview extras that I cut from the story. 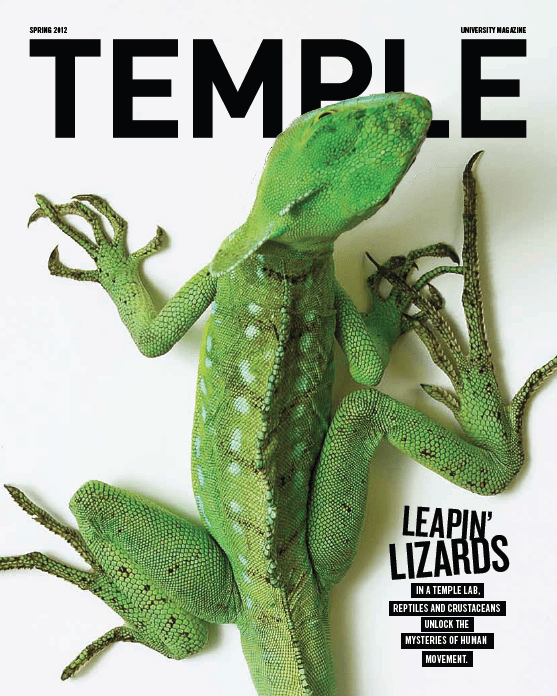 How large technology companies still lead innovation in the world is the focus of a freelance story I wrote for Temple Review, the alumni magazine of Temple University. Read the story here or download the PDF here, on page 24. An earlier nut graf: Innovation has been seen as strictly in the purview of tiny, agile startups, taking an idea and bringing it to market. But as the speed of new technologies continues to quicken, the need for large businesses to help bring products to market becomes even greater. So big corporations are not only playing a remarkably underplayed role in innovation, they are also innovating in how they change the world altogether. Give it a read and then check some of the extras from my interviews that didn’t make it into the piece. Though I took part in three of 14 JLab-funded Philadelphia Enterprise Reporting Fund projects, first announced here last fall, I led one of them. For Northeast Philadelphia hyperlocal NEast Philly, I helped lead the editorial direction of a project called District 172: the politics of change after state Rep. John Perzel. Following the indicted former state Speaker of the House, whose corruption trial has been postponed until the fall, we covered what the impact the loss of a 30-year state leader would be on his district, particularly a small swath that had served as his political base. Find all the coverage here. Reported two feature stories, including the final piece on how community building in Mayfair and elsewhere may be undergoing a sea change, and a second piece on the touchy subject of redistricting and Perzel, in addition to some smaller items. I interviewed Perzel’s replacement, Democrat Kevin Boyle, his staff and had Perzel fail to respond to comment following repeated attempts through his attorney. I spoke to more than a half dozen neighborhood leaders and others with perspective on the matter. With NEast Philly founder Shannon McDonald, I helped carve out the editorial direction and direct the Temple University Philadelphia Neighborhoods interns, who were our partnering organization. I designed the District 172 branding. I developed a layout for the District 172 landing page and worked with Frankford Gazette co-founder Jimmy Smiley to publish it. I gave copy and content to Smiley for our Players and Timeline section, two more interactive tools on the page. A year ago, I did a short interview with Rosemary Feal, then the Executive Director of the Modern Language Association, ahead of the group’s annual conference in Philadelphia. Find what I submitted below. Uwishunu.com (January 2009 to present): I blog on upcoming events and review concerts, culture, arts and entertainment in Philadelphia for the staple blog on what to do in one of the largest cities in the country. See my posts here, and my profile here. More than a year ago, I handled a half dozen interviews and a couple rewrites on a story for the Inquirer that covered what Philadelphia workplaces will look like in the future. As is sometimes the case, it never found its home in print. The story’s primary timeliness has been lost, but I think it still has merit. So, with permission from my editor, I share it below, in addition to a slew of extras from the heavy lifting of reporting. It was meant to be a localized version of a Time magazine cover story that caught my attention. As part of a push for a broader readership, back in March Technically Philly announced a content partnership with Philadelphia magazine and its new daily blog. Fellow co-founder Brian James Kirk has been writing most of the weekly posts, as he’s still freelancing. But last week, I filled in, penning a short feature on five City of Philadelphia departments that could use a touch of Web openness. 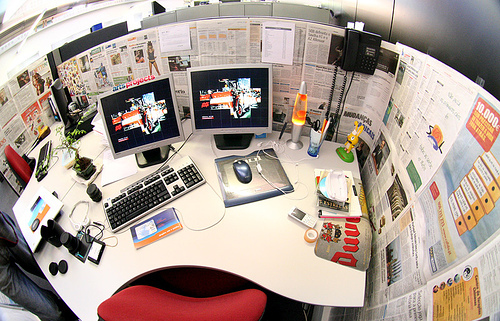 The use of technology to transform government has been a growing municipal interest in city halls across the country. Here, the City of Philadelphia has announced intentions to release a service-orientated 311 iPhone application, it’s applying for ultra high-speed broadband from Google and it’s in hot pursuit of a funded team of developers and technologists which may someday make our every government transparency dreams come true. The overtures are there, even if the substance hasn’t yet hit the pavement. Mayor Nutter Press Aide Katherine Martin addresses the April Fishtown Neighbors Association meeting. A few times a month, I go out to civic and town watch meetings in a variety of neighborhoods. Yes, I actually find most of them to be fun — local politics on the smallest of scale. Since moving to Fishtown, I’ve begun going to monthly Fishtown Action and Fishtown Neighbors Meetings and filing reports for the Fishtown Spirit. It’s all within a few blocks of my house and endearing to be sure. Each month, I’ll probably share those two and any other pieces I might have had in the Spirit. As I wrote after my first piece for my small, local community news weekly, it’s my way of getting to know new people and the issues facing them in a new neighborhood. City officials defended two controversial proposals to close a $150 million shortfall in the city’s 2011 budget at last week’s Fishtown Neighbors Association meeting. During the 90 minute session that saw raised voices and broad criticism of city spending, Deputy Streets Commissioner Carlton Williams addressed a proposed $300 trash collection fee and Mayoral Press Aide Katharine Martin talked about the two-cent-per-ounce sweetened beverage excise tax. Both proposals need City Council approval and remain executive branch proposals that are vying against ongoing deliberations, including suggestions to raise property taxes and tax smokeless tobacco products. Read the rest here, or below find other pieces I’ve done in the past few months below.